The Silence begins when the world is attacked by a flock of terrifying creatures who hunt their human prey by sound, which sounds like, you know, bats to me. Anyhow, when these bat monsters attack the world, 16-year old Ally Andrews (Kiernan Shipka), who lost her hearing at 13, and her family must seek refuge in "a remote haven" and wait it out. But things aren't going to be so easy for the clan as they soon discover a sinister cult eager to exploit Ally's heightened senses. Stanley Tucci says he took the role because of this. "I've done sci-fi movies like Transformers, but I've never done anything quite like this. The Silence is a combination of horror, thriller, and drama. I liked how sparse the writing was; a lot of it is without words, which allows John to do really interesting things visually as a director, and for us actors to communicate in other ways." Tucci then goes on to promise that even though The Silence boasts a supernatural premise, the film ultimately has a grounded quality to the story. "There's a believability to how fast the world gets turned upside down. I like the family's dynamic, and that they're living this normal, everyday existence when suddenly these horrible circumstances bring them together. They become very different people." The Silence isn't the first dabble into sci-fi and horror for either Tucci or Shipka. Shipka has starred in genre films such as Alex and David Pastor's Carriers with Chris Pine, Piper Perabo, Emily VanCamp, and Christopher Meloni, along with Oz Perkins' phenomenal The Blackcoat's Daughter co-starring Emma Roberts, Lucy Boynton, Lauren Holly, and James Remar. Tag to that, the young actress also had a role in Deborah Chow's horror-ish retelling of V. C. Andrews' horror-ish novel Flowers in the Attic co-starring Heather Graham and Ellen Burstyn. Oh, and a little show you might have heard a thing or two about called Chilling Adventures of Sabrina. Meanwhile, Tucci, who is best known for his roles in Captain America: The First Avenger and The Hunger Games franchise has lent his prestige to a handful of genre films in the past. These movies include George A Romero's Monkey Shines, Peter Jackson's adaptation of Alice Sebold's The Lovely Bones, and most recently, Stefan Ruzowitzky's zombie action horror film Patient Zero co-starring Matt Smith and Natalie Dormer. Tucci can be seen next in Matthew Vaughn's Kingsman: The Secret Service prequel, Kingsman: The Great Game which is set to feature Aaron Taylor-Johnson, Ralph Fiennes, Matthew Goode, and Gemma Arterton. 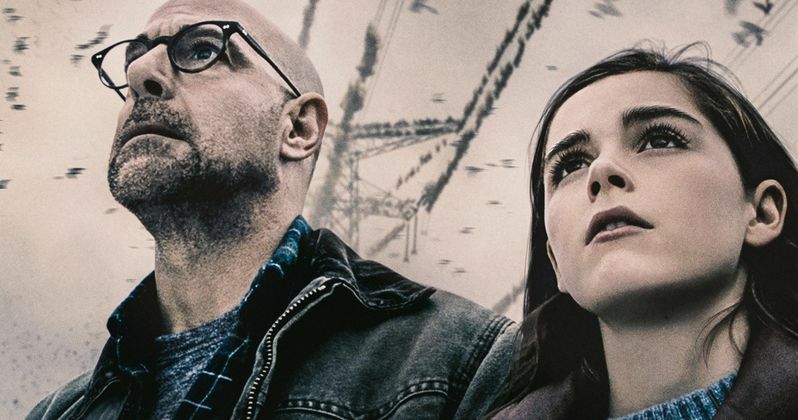 Tucci and Shipka's The Silence co-stars include Miranda Otto (The Lord of the Rings: The Return of the King), John Corbett (My Big Fat Greek Wedding), Kate Trotter (It: Chapter Two), and Kyle Breitkopf (the voice of Gekko / Greg on PJ Masks). The Silence will hit Netflix worldwide on April 10.